Step 1: In a shallow dish whisk together soy sauce, sesame oil, honey, ginger root, and garlic. Place chicken breast halves into the dish. Set aside to marinate for 15 minutes. Step 2: Lightly grease the grill grates of an outdoor grill. Heat the grill to medium-high heat. Drain the marinade from the chicken into a small saucepan. Bring to a boil, and simmer over medium heat for 5 minutes. Set aside for basting. Step 3: Place chicken breasts onto the grill and cook for 6 to 8 minutes per side, or until the juices run clear and the chicken is fully cooked (the internal temperature has reached 165 degrees). 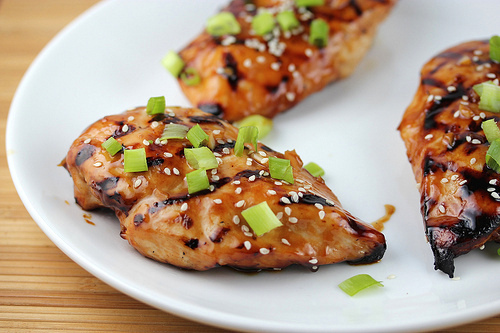 Baste the chicken frequently on both sides with the remaining marinade while grilling. The chicken will turn a golden brown color.